(Reuters, Oct. 8, 2016) JAKARTA — An increasing number of Indonesians are taking a stand against digital games like Pokemon Go that they say erode values, and encouraging children to play traditional toys like wooden spinning tops and bamboo pinwheels. Tens of thousands of Indonesians were hooked on Nintendo’s augmented reality app, in which players hunt virtual characters in real-life places, months before the smash-hit game was officially launched in the Southeast Asian country. But parents and teachers worry that children get too caught up in the virtual world and are missing out on interacting with each other. Some parents are nostalgic about the games they used to play and want to introduce their children to them. 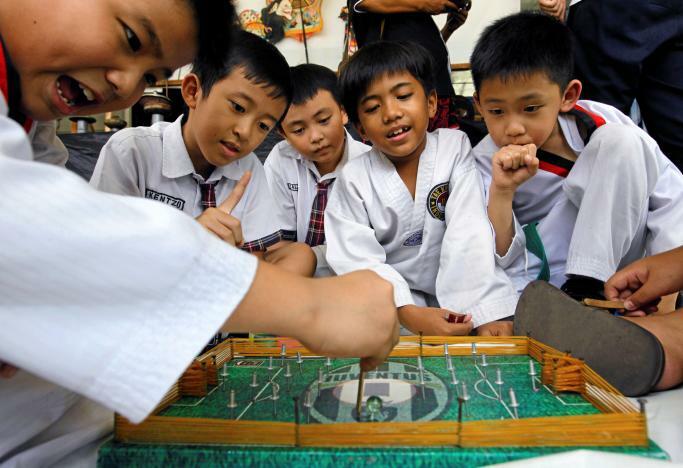 Hundreds of parents and children attended a traditional games festival on a recent weekend at the Pilar Bangsa, or “pillar of the nation”, school in West Jakarta. A gaggle of children huddled around a wooden board, taking turns shooting marbles at goal posts made of rubber bands in a version of table soccer. Others were tying strings around tops and spinning them on a circular platform. “Traditional games involve more activities, whereas electronic games only require kids to use their thumbs,” said Januar Surjadi, who was teaching his three-year-old boy to play with a bamboo toy that made a clicking sound when spun. Some games like “wayang”, or traditional puppets, and “congklak”, which requires players to collect as many “seeds” as possible in the holes of a wooden set, have been passed down through generations. Pilar Bangsa Principal Agustinus, who goes by one name, said his school would organize more events to introduce kids to traditional games. His school is not the only one. Education ministry official Essi Hermaliza said authorities aimed to instill old values in students through traditional games across the country. The mayor of the city of Bogor has renovated a park and equipped it with wooden stilts and other toys to “help children avoid Pokemon Go”, media reported recently. Traditional toys are often cheap – some sell for a dollar or less – but even so present an opportunity for businessmen like Fahrudin, who gets toys made in villages and sells them online. “The response from consumers has been positive and there’s still a lot of demand,” he said at his warehouse near Jakarta, where workers were packaging toys for delivery. For children like Michelle Miranda, 13, traditional toys won’t replace her electronic gadget, but they are still fun. “I’m getting a little bored of Pokemon Go because it’s harder to find the rarer Pokemons,” she said. (The Japan Times/Reuters, Sept. 30, 2016) – In Japan, where women do five times as much housework as men, three male politicians have donned “pregnancy” vests in a campaign urging men to help out more at home. In a video titled “The Governor is a Pregnant Woman”, the three men, who are all governors of southwestern prefectures, put on a 7.3 kg (16.1 lb) vest that simulates a woman who is seven months pregnant. The video, launched on Tuesday, is the brainchild of the Kyushu Yamaguchi Work Life Promotion Campaign, which hopes to encourage the nation’s notoriously workaholic men to adopt a more balanced life and share household chores. Accompanied by uplifting music, the politicians groan their way up and down stairs, clutch their bellies as they ease themselves into cars and struggle to bend over. One man tries to pull on his socks and finally gives up in exhaustion. Another is offered a seat on a bus. “This really drags at your shoulders and back,” Shunji Kono, governor of Miyazaki Prefecture and a father of three, said about wearing the vest. Japanese men were the most unhelpful in the world, a 2014 OECD survey (Organization for Economic Co‑operation and Developement) found, doing only one hour of chores a day compared to five hours for their wives. (UPI, Oct. 10, 2016) FOLLY BEACH, S.C. — Cannonballs from the Civil War were found on a beach in South Carolina after Hurricane Matthew passed over the state, according to officials. The Charleston County Sheriff’s Office and the U.S. Air Force Explosive Team confirmed the finding of an “old Civil War Ordnance” at Folly Beach in South Carolina, detonating some and taking others to the nearby Naval Base, authorities reported. 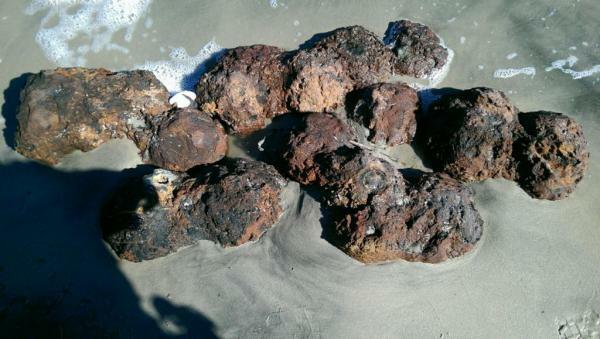 Former Folly Beach mayor Richard Beck found the cannonballs — there were 15, welded together by rust — during a walk on the beach investigating the storm’s effects. Beck called police to investigate the cannonballs, which were identified as such by an officer who is a Civil War reenactor. Officers started investigating the scene around 12:30 p.m. on Sunday, confirming they were cannonballs, they could not detonate them until around 7:00 p.m. because of the tide. Officials at Joint Base Charleston were expected to receive and destroy the remaining cannonballs on Sunday night, according to Eric Watson, a spokesperson for the sheriff’s office.